Are you tired of cleaning up spills and messy countertop areas that are normally associated with public brewers? 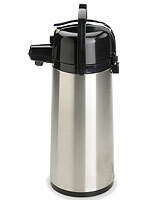 Do you like the look of a stainless steel carafe, but are afraid it's too expensive? 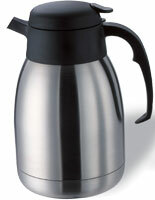 This site features many coffee airpots at some of the cheapest prices offered on the internet. Airpots are commonly seen in places like a small local shop, doctors' offices, large conferences or even retail stores. The unique design and sleek stainless steel finish is suitable for most any type of environment. 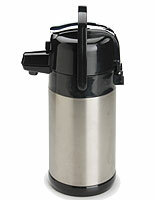 A coffee airpot is the most popular tactic of providing hot beverages to large crowds of people. Guests and patrons appreciate the ability of being able to serve themselves and make their drink the way they like it. Use this hot tea and coffee airpot to offer coffee, tea, hot chocolate or hot water. Food service workers and caterers like the ease of use and simple clean-up time. Providing complementary beverages at conferences, meetings, conventions, parties and other settings is a simple but kind gesture your guests will appreciate. When used with one of these wire racks, the set up and take down of a drink display is easy and takes a matter of minutes. This airpot is also optimal for retail use, as in a café, restaurant, cafeteria or retail store. Do you own a cafe and often set up stands at community events like street fairs, parades or carnivals? 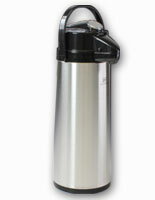 No need to worry about spillage or the stainless steel dispenser tipping over in your vehicle. The two liter coffee airpot won't leak if tipped. 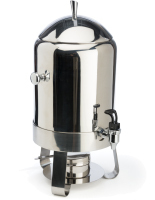 Airpot dispensers are available in multiple styles, including glass-lined and stainless steel-lined. 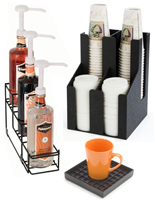 We also offer organizers and racks to keep your beverage station looking neat and sorted. Each of these air pot dispensers holds 2.2 liters or more (or 74.4 ounces) of liquid. 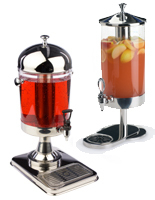 They feature an easy-pump action lever for quick pouring of tea, or other hot beverages. Stainless steel-lined air pot carafes can keep beverages warm for four to six hours while glass-lined accessories retain temperatures for up to eight hours! These dispensers are an excellent option for busy hosts as they allow a longer span of time between changing out hot drinks. How are these airpots cleaned and maintained? Due to the heat sensitive nature of these beverage dispensers they should not be placed in a commercial dishwasher. An airpot or coffee carafe should also not be completely submerged in hot water. For best results a mild dish detergent and warm water should be used along with a soft rag to maintain the integrity. What are some advantages to using an airpot vs. a standard coffee pot and warming plate? Brewed coffee will go stale after about 20 minutes in an open-air coffee pot. Customers are less likely to make a mess or spill hot drinks on themselves due to the pump action lever design. Airpots maintain the freshness of the coffee or hot beverage for many hours. 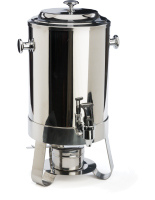 There are also airpot racks and stands offered on this website that can be used along with the stainless steel carafes and dispensers to further organize your buffet area or coffee station in your cafeteria. These racks are made of heavy gauge wire with a black finish. The stands help to keep the dispensers from being moved or accidentally bumped. The two section rack also features a smaller area to place a container for milk or creamer. These racks can be used together in large groups to replace the standard coffee pots and brewers. The relatively small depth and stair-step design takes up little counter space. All of these beverage dispenser accessories make for neat and organized drink station. All of the organizers also feature a platform area to place a drip tray, (included) on to catch any spillage. The catch-trays are made of black sturdy plastic that are designed to contain liquid spills. These square drip trays are easy to clean and can be placed in a commercial dishwasher to sanitize. High capacity coffee dispensers are another great addition to the full lineup. What's one of the biggest benefits of organizing any coffee station? Simple. THERE'S NO MESS. The more organized any cream and sugar station is kept, the more likely patrons are to put everything back where it belongs and leave the area clear for other customers. Combine lid holders, syrup stations, straw collectors and drip trays to maximize cleanliness and leave employees with less of a mess to have to worry about. Customers will appreciate an area that stays to clean to fix up their coffees, chais and espressos, while employees will appreciate the lessened workload.